Here's the matrix that Gary puts together every year determining how the ECAC Quarterfinals are going to shake out depending on who wins each first round matchup. It'll be updated on Saturday night assuming that at least one first round series is a sweep and at least one goes to game three. For what it's worth, in 12 previous seasons under this playoff format, the first round has gone to chalk only twice - 2007 and 2008. Every other year had at least one road team advance to the quarterfinals, which means all four home teams winning happens as often as a 12 team upsetting the 5 seed. 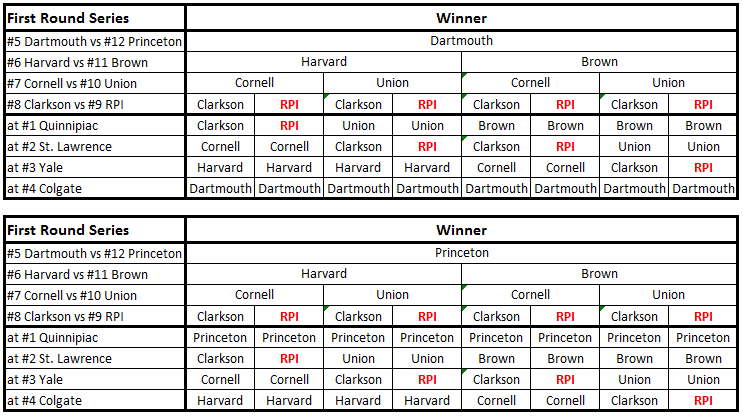 For RPI, if they're able to get past Clarkson, you can expect a trip to Canton (oh, joy) as the most likely scenario. Quinnipiac would happen only if there are no other road teams winning their matchups. Yale would happen only if two other road teams won in the first round (has happened once, in 2011). Colgate would happen only if no home teams win their matchup (which has never happened). In the meantime, here are some quick capsules on what we're looking at this weekend. Doing this in reverse order. If you want our RPI analysis, just skip to the bottom. KRACH: Dartmouth 23rd (151.7); Princeton 54th (24.3). February: Dartmouth 6-2-0; Princeton 1-6-1. On paper, this is easily the most open and shut series of the first round. Dartmouth absolutely finished strong and the Big Green were unbeaten in 10 of their last 12 games. Princeton, on the other hand, hasn't won a road game since they beat Clarkson in Game 1 of the first round last season, a year ago on Saturday. Princeton's offense was the worst in the league and it was not even close - every other team in the league with the exception of Clarkson, Cornell, and Brown scored more than twice as many goals in league play as did the Tigers (the Golden Knights missed doubling up the Tigers by a single goal). The defense, power play, and penalty kill were all 11th in the league. It's not all about Princeton being terrible. The Big Green probably would have had a first-round bye if not for their middling home ice record, but they've been able to ride strong offensive output and a more than acceptable defensive showing to become a real contender in the ECAC. They're on a roll and a team that has only won twice since the beginning of December isn't likely to pick up two wins in a row against this team. Twice in 12 years under the current playoff format has a 12 seed knocked off a 5 seed - Brown in 2009 and Colgate in 2011 (remember that?). It's been done. Interestingly, the last six 5/12 matchups in a row have gone to three games, with Brown in 2008 the last 12 seed to be swept. But that's a trend that's likely to be broken at some point, and this year's Princeton team is probably a good bet to do just that. With only 6 points on the campaign, the 2015 Tigers had the worst ECAC season since the 2003 Tigers also finished with 6 points. Anything short of a Dartmouth sweep would be a real eye-opener, but Princeton advancing would probably be the biggest shock of any of the 5/12 upsets we've seen so far. '09 Brown was 14 points behind Harvard in the final standings, '11 Colgate was 13 points behind RPI. Dartmouth finished 20 points in front of Princeton. KRACH: Harvard 22nd (157.6); Brown 45th (47.8). February: Harvard 3-6-1; Brown 4-2-2. A month ago, this would have been just as open and shut as Dartmouth-Princeton seems to be, perhaps even more so. Then again, a month ago Harvard looked like a pretty sure bet for a first-round bye, so this wasn't even really in consideration. The Crimson should still have a pretty distinct advantage, playing at home and still full of talent - but they don't look nearly as unbeatable as they once did, and Brown no longer seems to be the pushovers they looked like for much of the season. On New Year's Day, the Crimson looked to possibly be the best team in the entire nation. But 2015 in general has not been kind to Harvard, as they're just 5-10-1 since the ball dropped. Brown has the same number of wins across the same time period, but they've racked up the majority of those wins at the right time of the year - the end, when any team prefers to be reaching their peak. Before finishing the season with a 4-2 loss at home against a surging Colgate, the Bears had been on a six-game unbeaten streak (including a win over Harvard) and were unbeaten in seven of eight. What's behind Brown's turnaround? Defense has vastly improved from where it was at the outset, led by Tim Ernst in net and that helped the Bears not only separate from Princeton down the stretch, but also threatened the Capital District schools in 9th and 10th on the last weekend of the regular season. A naysayer could look at the Bears' late schedule and see a whole lot of teams that finished in the bottom half of the league standings, but Ernst also helped Brown very nearly pull off an upset of Quinnipiac - and then, of course, there's the win over Harvard. The Crimson, for their part, were not just taking part in what has become a fairly typical February swoon (when there's a place to swoon from, of course - the Crimson finished dead last in 2013). They've had to deal with a rash of injuries - especially to Patrick McNally and Sean Malone - that has kept their high-flying offense grounded with some frequency down the stretch. Malone is now back, but McNally has not played since January, when it was speculated that he could potentially return for the ECAC playoffs. At the end of the day, when you consider the entire season, Harvard's #1 offense is taking on Brown's #12 defense in this series, but neither are performing the way they were in November, December, and January. The Bears are also still dead last in both power play and penalty kill - they had just 6 power play goals in league play this season, which had them at +2 for the year after giving up four shorties. That bodes well for Harvard's physical play. Much hinges on whether McNally can return. He'd be a serious injection for the Crimson and his presence would make for serious concerns for the Bears. For Brown, as has been the case for several years, if they can get outstanding goaltending, they can win a playoff series. That makes Tim Ernst the great equalizer. Harvard's the favorite here and rightfully so, but if Brown can pick up a win or two, it shouldn't come as a major shock, perhaps only if Patrick McNally is dressed to play. KRACH: Cornell 29th (113.0); Union 33rd (98.0). February: Cornell 2-3-3; Union 3-5-0. The Dutchmen have been all over the map this year. At times, they've been unstoppable on offense. At other points, they've been unable to find the back of the net with a map. Cornell, well, they've been more or less stable. They've been pretty solid on defense. Offense, though... they get some, but not a whole lot. We made a lot of RPI being unable to win games when they give up three goals, but for Cornell that goes back even farther - they haven't done it since the first two games they played last season. Since 5-3 and 4-3 wins at Nebraska-Omaha in October 2013, the Big Red are 0-17-4 when allowing three goals. The big difference here, of course, is that they don't do it very frequently. They don't score three often either - only nine times this season, just three more times than they were shut out. Union's February was almost as awful as it gets. During a dreadfully horrifying five-game losing streak, the Dutchmen scored a grand total of two goals while allowing 14 (although 7 of those were in one game). They did, however, right the ship at the end of the season with wins over St. Lawrence and Clarkson. Cornell has kinda sputtered down the stretch as well, though. One win in their last six games (against Union). Ties against a faltering Harvard, and two bottom four teams in RPI and Brown also happened during that run. It's not a finish that inspires a great deal of confidence, but it's not like the offense or defense was any better or worse than it really was all season. Lynah Rink, of course, is a huge advantage for the Big Red. They haven't lost a playoff series there since 2007 (against Quinnipiac), which was only the third time they've ever lost a home playoff series (1988 and 2004, both against Clarkson). That's in stark contrast to Union, which has never won a road playoff series. Ever. Yes, Union has won a national championship, but never a road playoff series in the ECAC. All of that said, if Union's offense wakes back up and becomes a serious challenge for Cornell's defense to have to tangle with, the Dutchmen could certainly put up a fight in their unlikely quest for a record-tying fourth straight ECAC title. This isn't a lopsided matchup by any stretch of the imagination: Cornell isn't unstoppable and Union isn't helpless. The history and the comparison of the two teams' recent struggles certainly points to the Big Red as a very distinct favorite, however, especially given the relative ease with which Cornell swept the season series. KRACH: Clarkson 40th (62.5); RPI 42nd (53.5). February: Clarkson 1-6-1; RPI 1-5-2. The 8/9 matchup frequently creates some interesting situations, if only because it's always the pairing with the least between the teams. Fittingly, the 8 seed has won six of the 12 matchups since the ECAC's current playoff structure went into place in 2003 (do the math, that's six for the 9 seed, too). In this case, it's hard to pick a favorite other than to just say that Clarkson has home ice. The problem there is that while RPI has had notable problems winning home playoff series recently, Clarkson hasn't been lighting the world on fire at Cheel, either. Since their last ECAC title in 2007, the Golden Knights are 1-4 in home playoff series, with the lone win coming last year as the 5 seed against 12 seeded Princeton, and as mentioned above, the Tigers won Game 1. That stretch includes the 2012 series against RPI, which went to a Game 3. It's not that this is a matchup of two solid teams, but rather, it's a matchup of two teams that have proven to be solidly mediocre, especially in the home stretch. The Engineers wrapped a nine-game winless streak by ekeing out a home victory over St. Lawrence on the last night of the season, Clarkson lost their last seven games in a row to end the season against teams that were not RPI. That has to at least fill Clarkson with a little bit of confidence. There's probably no one else that the Golden Knights really wanted to face other than RPI, and thanks to their tie with the Engineers last weekend, they get to do it at home. When you compare these two teams, there's a lot that's similar about them. Both struggled to score goals for much of the year. Both have defenses capable of stealing games (or this entire series), but have legitimate concerns with which goaltender to utilize. Jason Kasdorf for RPI and Steve Perry for Clarkson have been the go-to-guys, but both had injury problems at times this year and struggled to come back from them. Behind them are Scott Diebold and Greg Lewis respectively, who haven't individually been amazing but who both keyed their team to their biggest success of the final weekend. There's a slight edge for Clarkson overall but it's based almost entirely on the facts of being at home and having had recent success against RPI. Everything else about this pairing screams complete tossup, and when you've got that element combined with the defensive capacities of these teams, it's all going to probably boil down to which team gets better defense. The team that locks down their net is going to advance, the one that can't is going to have seven months to think about why that element, key for success all season long, failed them at the last moment.